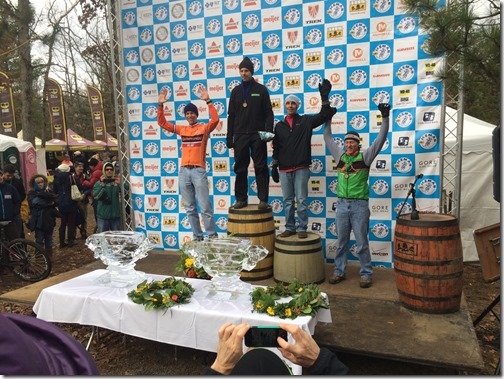 Endurance mountain biker Ed Serrat has had a great season, with notable results across the country. An 11th place finish at Oregon's High Cascades 100 was followed up this past weekend with 13th at Fool's Gold. The latter result was achieved after delays caused by a rear tire puncture in the early miles. AES mountain bike racer Ed Serrat finished his season on a high at The Iceman Cometh in his home state of Michigan. Ed had been targeting Iceman and had an excellent race against a stellar field. Ed's season has been fantastic and we're looking forward to 2016! That's Ed on the left! Also today, AES Pro CX rider Elle Anderson rode to a podium finish in the Derby City Cup ProCX race against a stacked field. Elle has been preparing for her 2015/2016 European campaign and she's off to an excellent start. Elle on the right! Photo by SRAM. 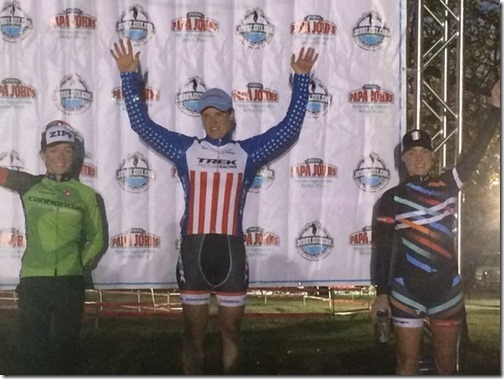 Meanwhile, at the OBRA Cyclocross Championships, AES athlete Ann Kennedy scored a 3rd place finish in the Masters A class. The holidays can be a stressful and disruptive time for athletes. There are often loads of travel, relatives that are stressful to be around, and sick people sneezing on you. It's not ideal for training, but normally that's not a problem as it is the off-season. 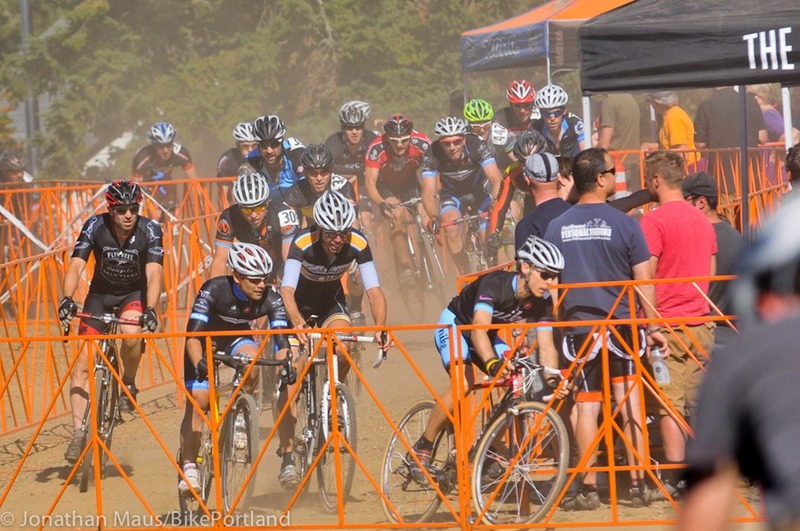 For those who plan to race CX Nationals, however, it's peak season! 1. Get plenty of rest. When you're doing those tough intervals (more on those later) in cold and wet weather, you will be a bit more run down and more likely to inherit Uncle Elmer's cold. So, make sure you sleep well and often, taking naps if necessary, especially after workouts. Naps are also a great way to avoid hanging out with boring relatives. 2. Stay warm. Shivering can burn as many calories as a nice L2 ride, and you want to save that energy for training and for your race. It is cold in Wisconsin and it is cold on airplanes. Bring your warm layers, a cap and gloves, and wear them before and after training and while you travel. 3. Go easy on the sweets. The holidays are for feasting, but if you plan to be at your best in January, it will benefit you to stick to eating your fruits and veggies and some good protein. Save the sweets for while you're on the bike. Stay lean and mean. 4. Do your intervals. As you get closer to Nationals, your workouts will get a bit shorter, and a bit harder. By now, you have done the bulk of the LT work you need to do, and you should be honing the very top end of your form. This means a couple of days each week of Anaerobic Capacity (AC) intervals as well as some VO2 Max work. The key to getting the most from this hard work is solid rest (see #1!). 5. Minimize your stress level. This goes hand-in-hand with getting lots of rest. The holidays can be stressful for lots of reasons. Stress lowers your immunity to illness, wears you out, and makes your training less effective. Try to go into these weeks with a relaxed attitude. Channel your inner Dalai Lama and let stresses roll off your back. Focus on your objectives, and don't worry about your in-laws or whether or not you'll miss your connection. Following these few simple bits of advice can help get the most out of your Nationals bid. Good luck! 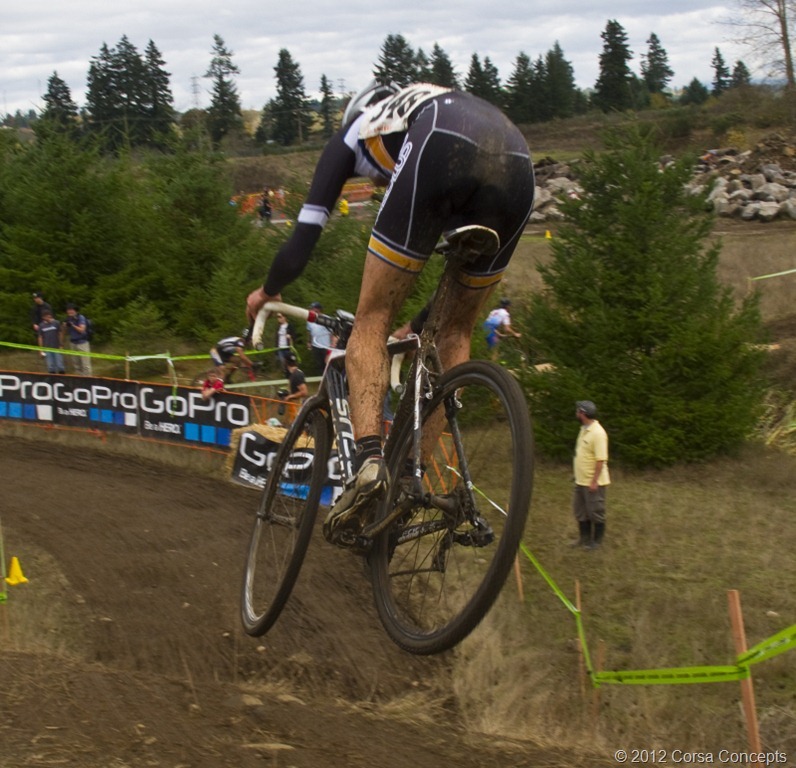 Cyclocross is great training for cycling and in endurance coaching circles, widely respected as not only a winter training sport, but a specialty in and of itself. It is technique-heavy, as cycling disciplines go, so it's a good place for roadies and the like to keep their skills sharp. 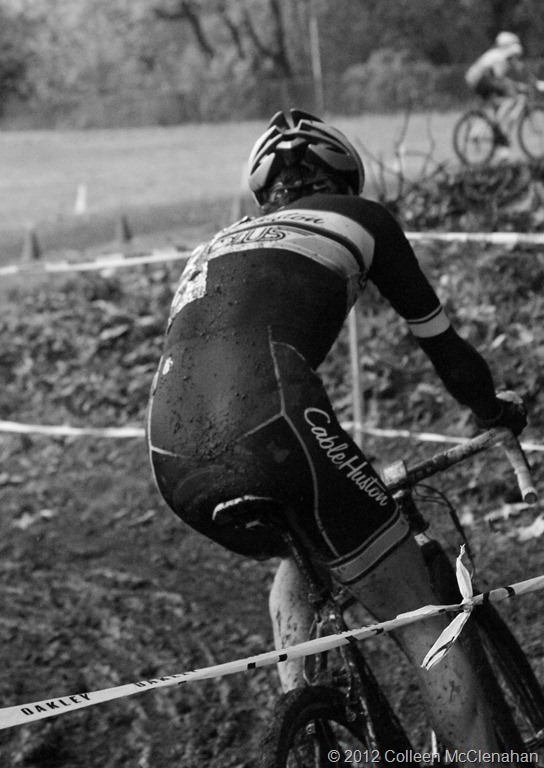 A few weeks ago, we covered the basics of cyclocross training and technique. Now, we'll delve into one of the more difficult aspects of technique - dismounting, carrying and getting back onto your bike. 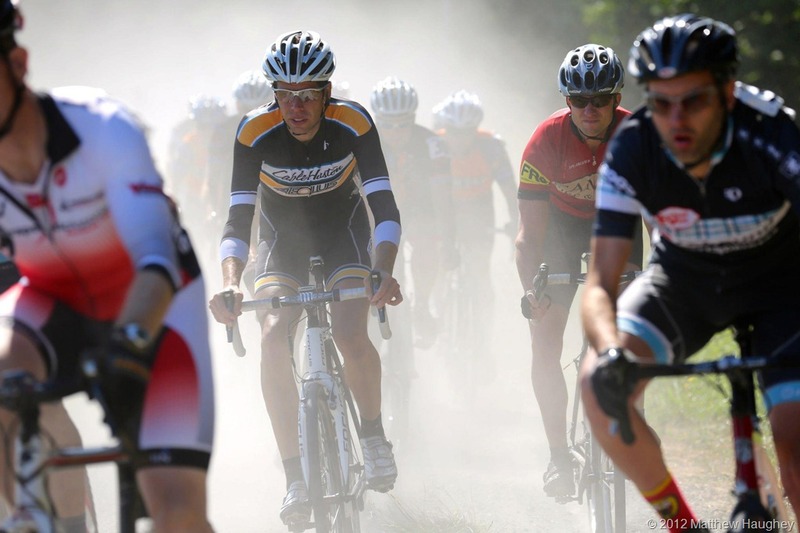 Of course, the best way to learn this is with the hands-on instruction of a coaching ride. Twist your left foot free of the pedal as you land on your right foot first (behind your left foot). Alternatively, you can "step-through"- instead of planting your right foot behind the pedal, step between your left leg and the bike and land in a run with your right foot in front. There are two main ways to carry your bike: the "suitcase" carry and the shoulder carry. For short sets of barriers or stairs, the suitcase usually will suffice. For longer run-ups and triple barriers, it's better to shoulder your bike. This one is easy. Once you have stepped off your bike, with your left hand on the brake hood and your right hand on the top tube, simply pick the bike up, like a suitcase. It's best to avoid the temptation to tuck it close to your body. 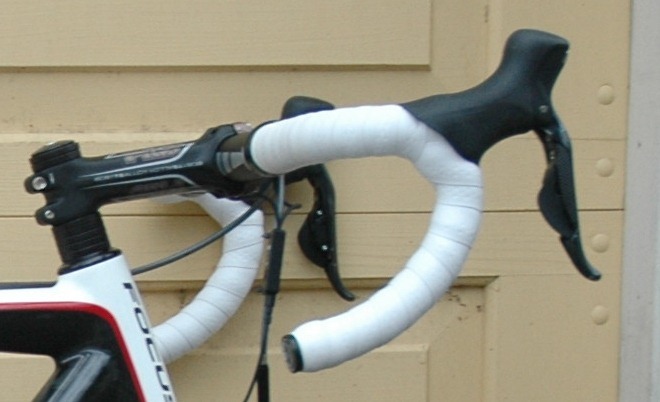 You can love your bike, but this is a good time to keep it at arm's length. Also, you only need to lift it high enough to clear the obstacle. Riders often lift their bikes higher than necessary, thereby wasting valuable energy. As long as the wheels clear the obstacle, that's enough. This one is slightly more complicated, but still not hard. 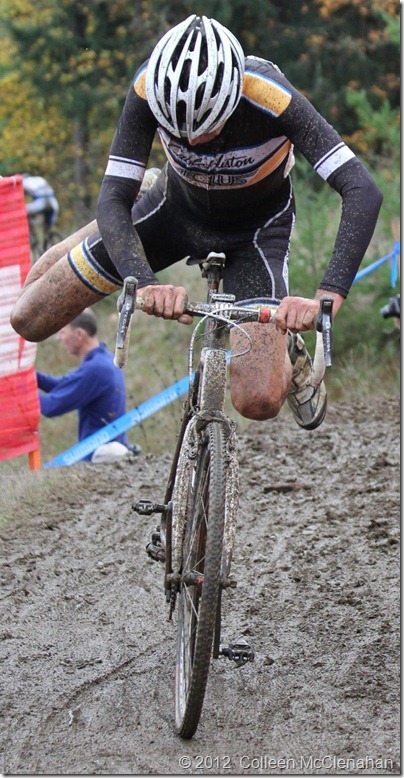 The dismount is very similar to the above, unless it's really smooth, in which case you may be able to skip grabbing the top tube and simply pick the bike up by the down tube as you dismount. Run, using your left hand for balance if necessary. Find your pedals, clip in, and keep pedaling! Stepping onto the bike. It doesn't look like I am running in this photo, but I am! All of these techniques require practice to master. You will know you have it right when you're racing and not even thinking about the next obstacle or what you are going to do to get over it. Focus on staying relaxed and strive for smoothness and fluidity. The smoother you are, the faster you will be. Barton Park is always a fun day out. 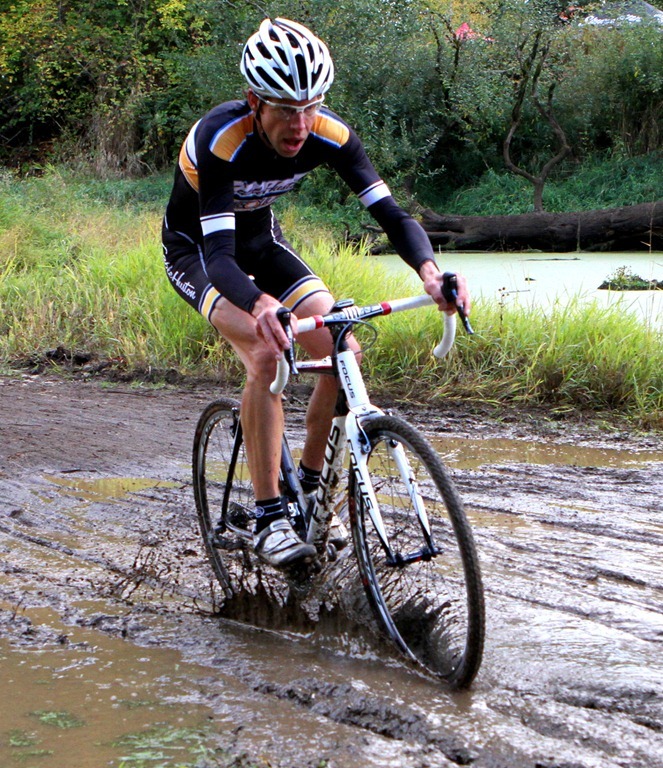 Despite (or, perhaps because of) being held in a gravel pit and adjoining county park, the venue offers a host of challenges for cyclocross racers. There is deep mud, shallow mud, gravel, pavement, puddles like small lakes, steep drops and two run-ups that feature a unique mix of mud and somewhat large stones! 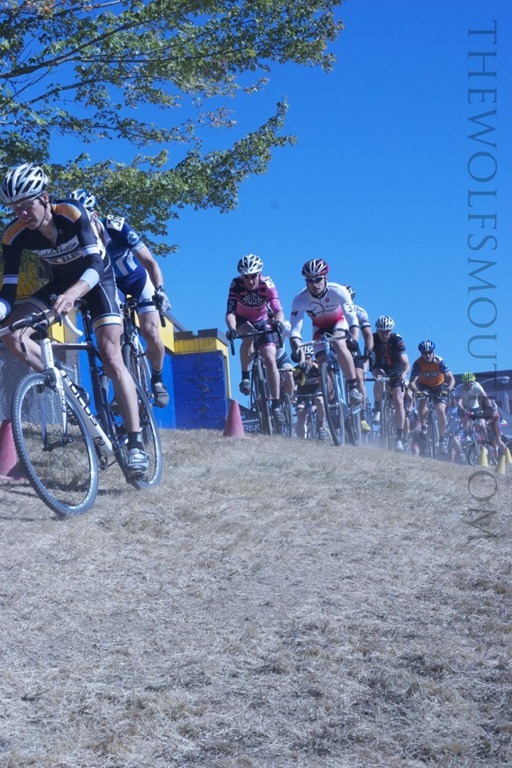 I showed up feeling a bit off my game and, having missed too many Cross Crusade races to score points, started at the back of the 70-strong field. My teammate Brook and I had a nice warmup spin, but we kept it short as the temperature was approaching 70 F degrees already – unusual for Oregon in November. Barton is a fast course, and so it is tough to start at the back and have any hope of making up a lot of places. Despite this, I got a decent start and really made sure to relax and not give too much in the first laps. This strategy paid off as I began to feel much better later in the race. Once the field thinned, I gradually caught several small groups of riders. On the last lap, I put in a hard effort over the triple barriers and got a gap on the group I was with, which I managed to keep to the finish. This was enough to net me 19th place on the day – one spot out of the points. Normally, this would be a bit frustrating, but with having arrived feeling a bit unfocused and starting at the back, I'm happy about it. Sadly, there is no data to report or analyze, as my Garmin decided to take a holiday. Although it showed the data on-screen during the race, it did not record any of it. Oh yes, it's cyclocross season alright. Today we raced the seventh round of the GPTB in Washington, just over the Columbia River from Portland. 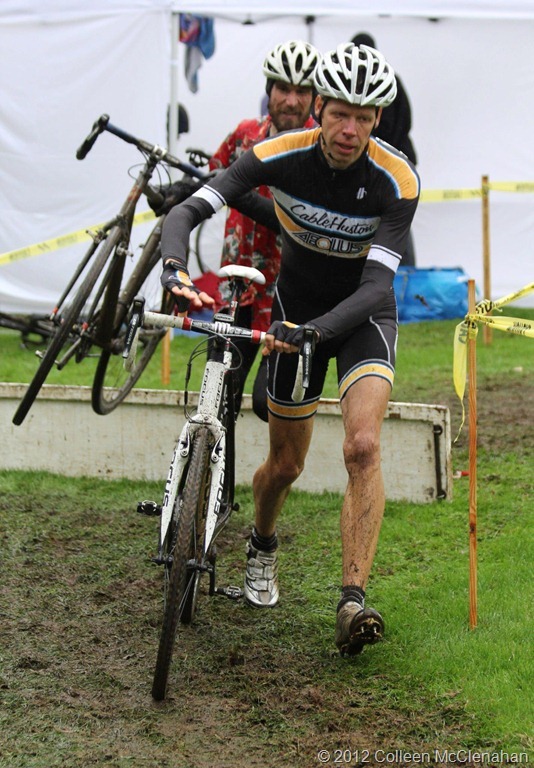 While it was relatively dry and dusty for the Cross Crusade in Bend, it was cold, rainy, and muddy for our race, as many think it ought to be for this sport. With greased legs and a happy stomach, I rolled to the line. I have a habit of starting too hard for my own good and today I was determined not to do that. It seemed to work as, when the whistle blew, I settled quickly into 5th or 6th position. 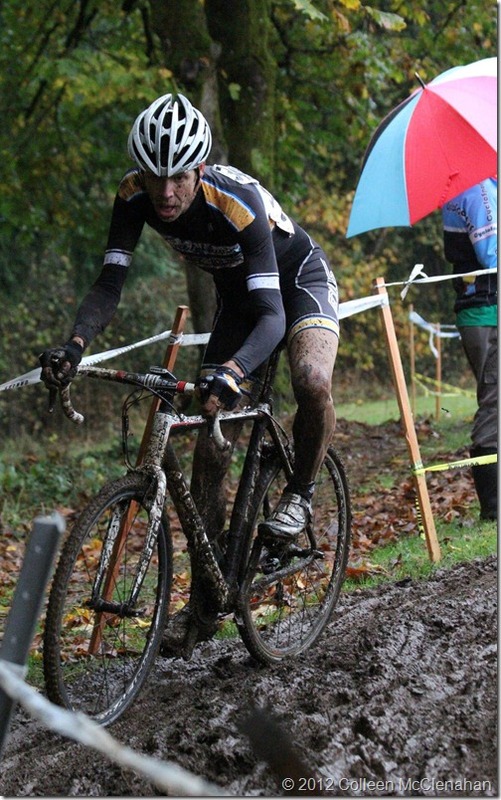 I stayed there for a lap or two while I got used to the flow of the course and the conditions. Besides three barriers on the flat bits, including one cleverly placed in the middle of a hairpin turn, the course had two nasty run-ups per lap. The first wasn't too bad at 26 to 30 seconds, but the second seemed to take forever. I was to be able to do it in 45 to 50 seconds, depending on traffic. In seven laps, these add up to about 9 minutes of deeply-tracked uphill mud running – nearly 15% of the race! I went a bit faster up the long run in the middle and later laps, so my slow-start plan seems to have worked. 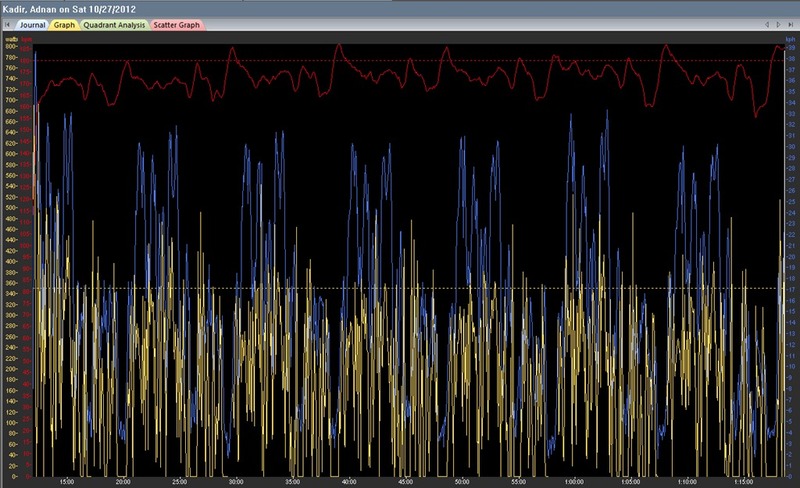 David Douglas CX #2: Red is Heart Rate data, yellow is Power data, and blue is Speed data. The dashed red line is at 180bpm. The dashed yellow line is at 350W. Click the image to magnify. 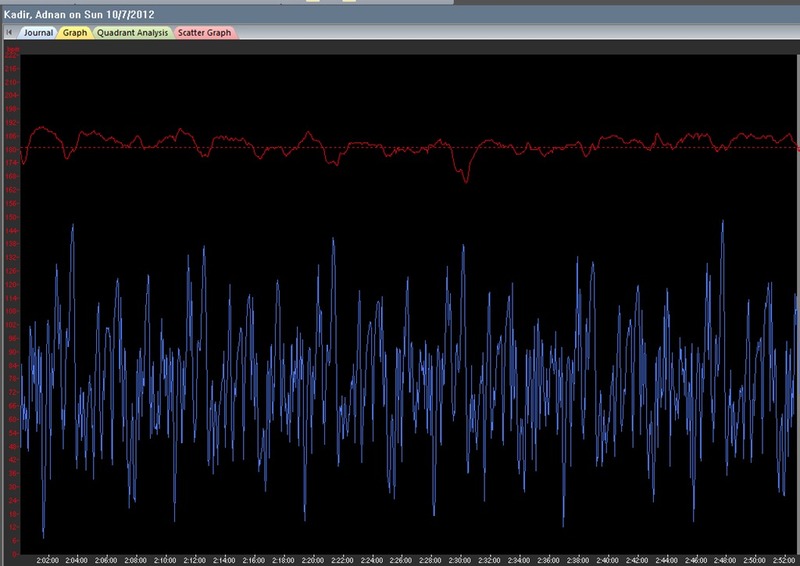 If we observe the relationship of speed (blue) to heart rate (red), it's interesting to note that the highest heart rates occurred at the lowest speeds. These were the run-ups. 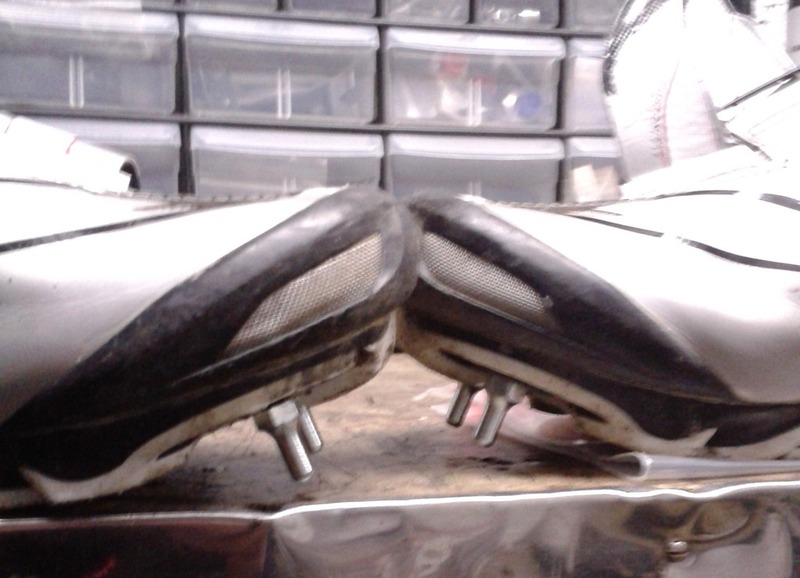 Each lap, there were two HR spikes where these happened, reaching 185+bpm. This speaks to the off-and-on nature of the race, and the difficulty the run-ups posed to good pacing. 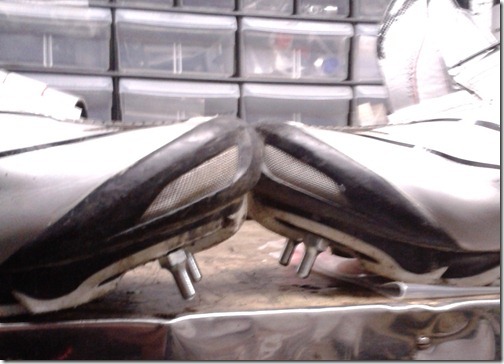 So, despite the spikes required for the run-up (both on my shoes and from my HR! ), I was able to start at a good pace and gradually increase it as the race went on. My HR average for the race was 173bpm – significantly less than my tested Threshold HR. Again, this is due to the off-and-on nature of this particular race. The first time up the long run-up. Running makes me feel haggard. It is no exaggeration to say that last week, here in Oregon, summer came to an abrupt end and winter arrived. One day it was in the 70s and sunny and the next it was in the 50s and raining. It's still raining, only now it is even colder. This sort of thing, of course, makes for great cyclocross. 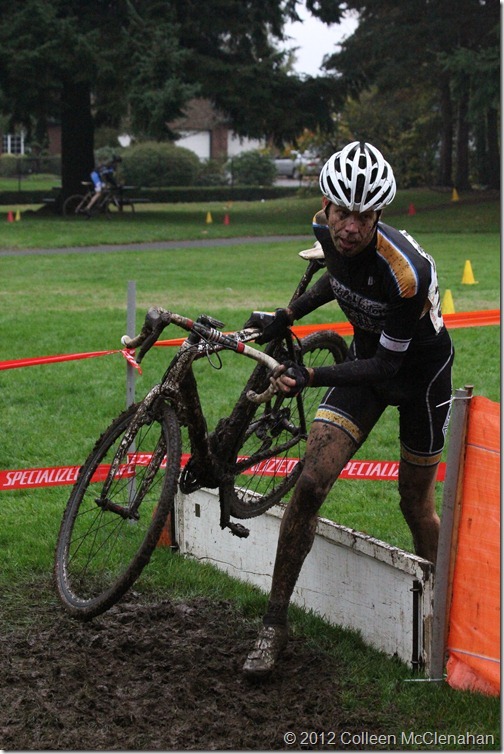 I think it is safe to say that the dust races of 2012 are over and the mud is here to stay. The weekend started with the Canby Cross-Word CX Challenge. 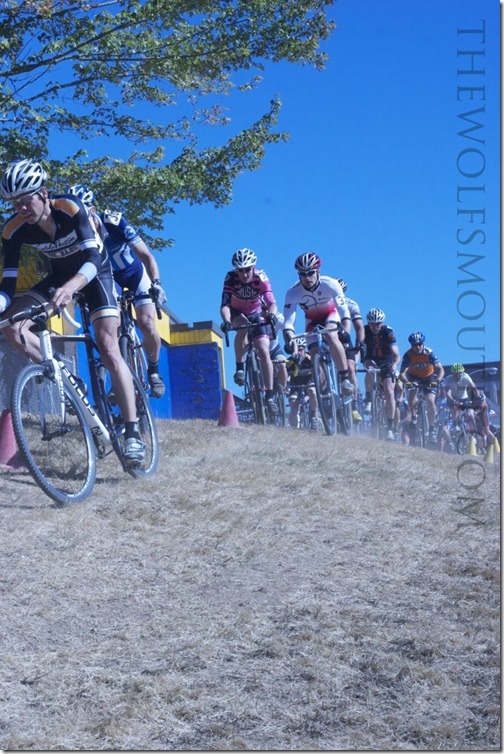 A smaller race, not part of either local series, it was nonetheless well-attended and saw some good competition. It was also the first muddy race of the year, and we all had to adapt to the new conditions after dealing with hardpack and dust thus far. I started at the back, but quickly made my way up into the top three. As you can see from the file below, I started a bit too hard and I paid for it later on. The first 1/3 of the race saw my HR average 183bpm, with correspondingly high power output (which I will keep a secret for now!). 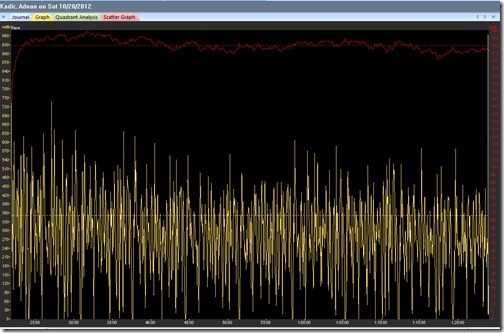 The rest of the race only saw an average of 179bpm – the cost of an imprudent start. At one point, I had caught the #2 rider, but a slip on corner saw him ride away and I had to settle for 3rd place on the day. 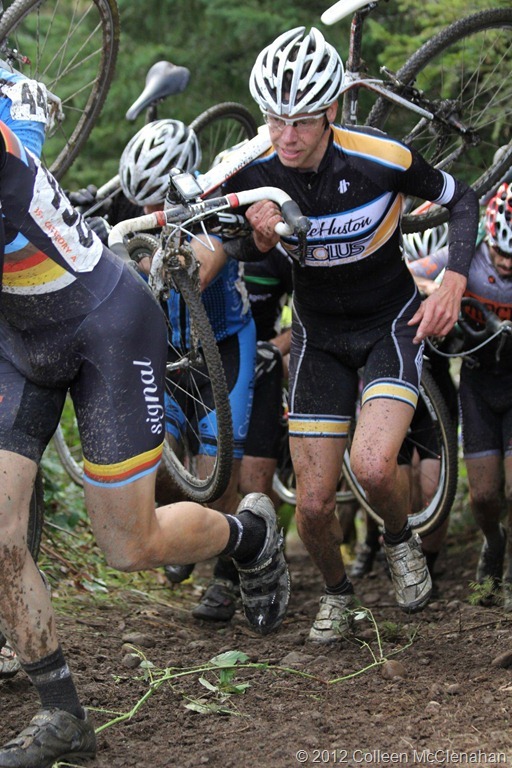 Small mistakes often have high costs in 'cross. 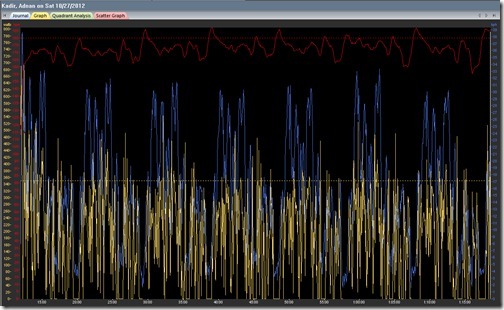 Canby CX: Red is Heart Rate data, yellow is power data. The dashed red line is at 180bpm. The dashed yellow line is at 350W. Click the image to magnify. 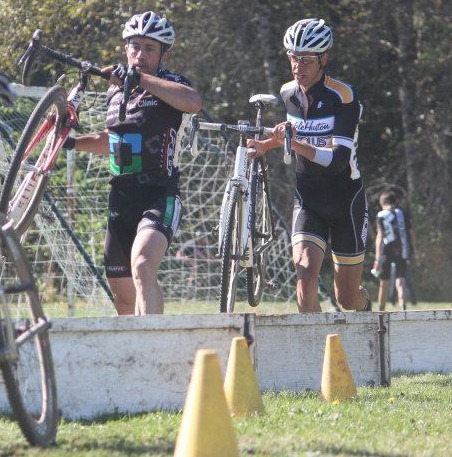 The weekend's second race wasn't what this cycling coach had hoped for. The Heron Lakes course at PIR is one of my favorites – flat, fast, and hectic. 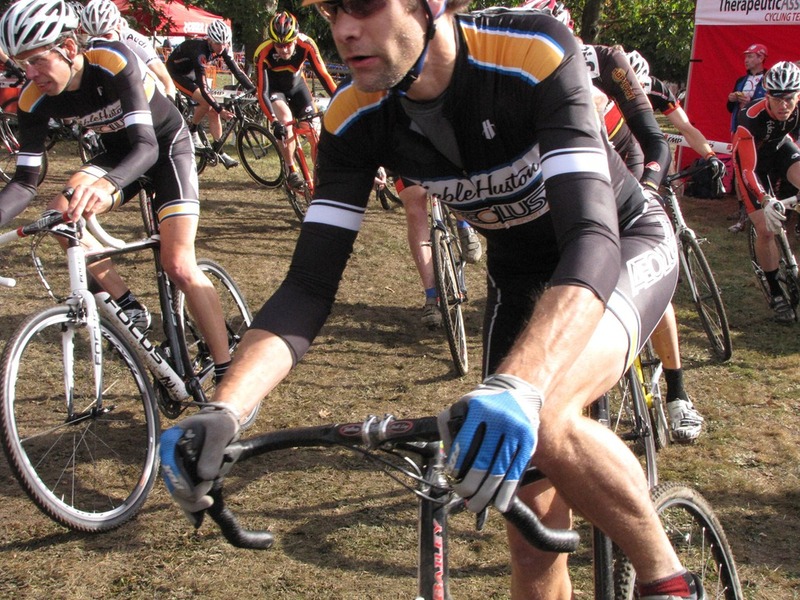 I missed last week's race (I was attending the USA Cycling Coaching Summit, my first one as a Level 1 coach) and so I had forfeited my call-up and had to start at the back again. 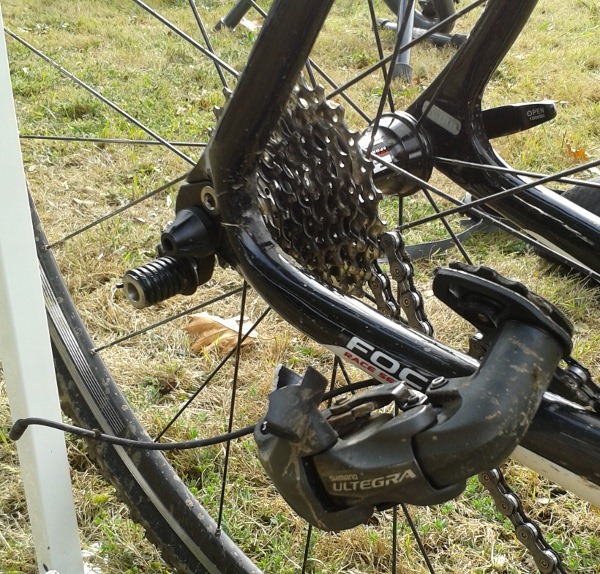 It didn't seem to make much difference as less than six minutes into the race, my rear derailleur decided to join my front derailleur and I was going nowhere. 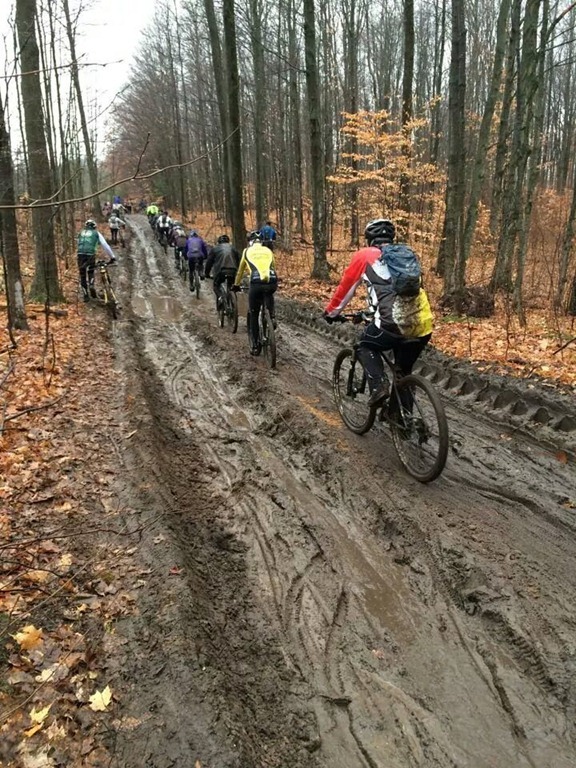 It was a curious failure as it did not seem to involve sticks or mud, or other riders. The body of the derailleur simply sheared off the pivot bolt. I'm looking at the bright side – I have one 3rd place, and my bike frame and my body are intact. It's easy enough to get a new derailleur. 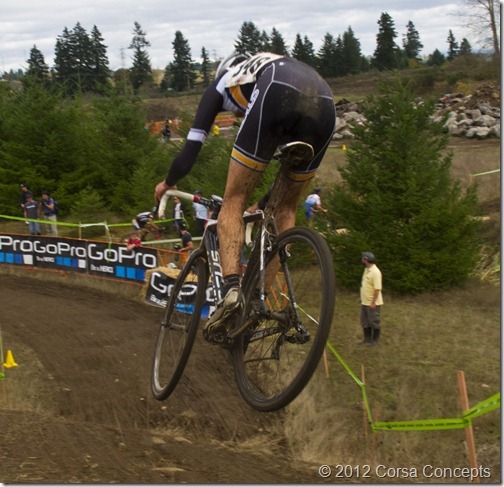 Canby CX. If I look surprised by the mud, it's because I am. Heron Lakes: My teammate Monty (aka Montador) and I before the start. 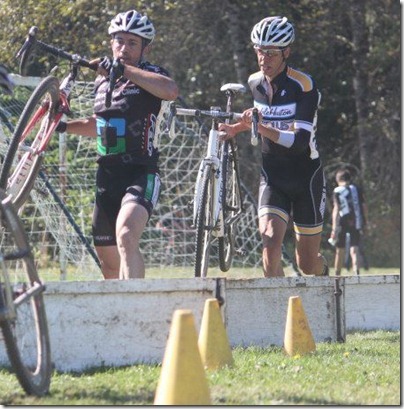 Heron Lakes: Erik V and I round a bend in the first 3 minutes of the race. That was about the half way point for me! Heron Lakes: My rear derailleur breaks, ending my race. Aw, muffin! A few weeks ago, an athlete contacted me asking for a few private coaching sessions on the basics of cyclocross. 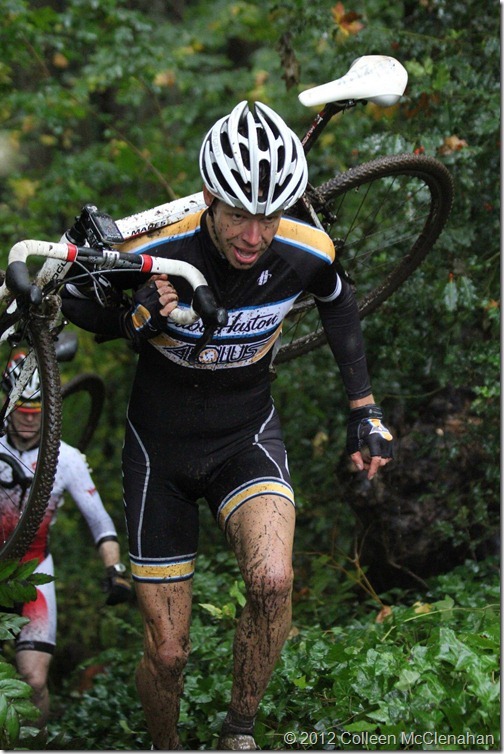 Those sessions seem to have worked as today he won his category at the Cross Crusade Rainier and now he has to upgrade! 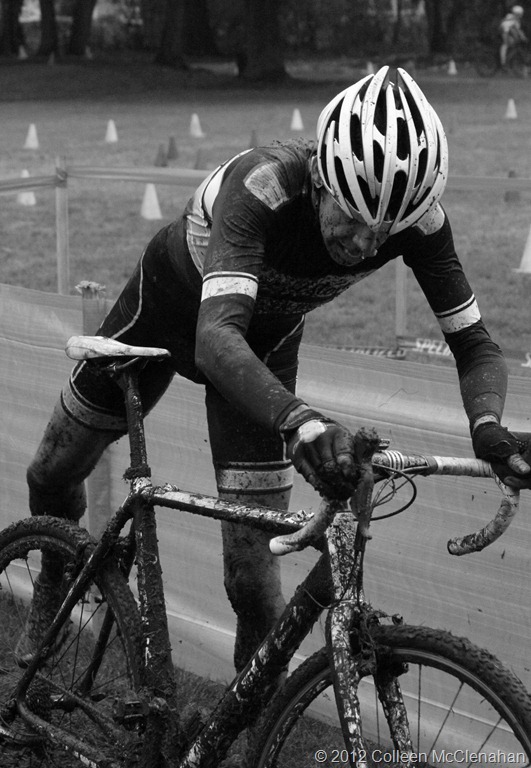 Although there is no substitute for some hands-on practical cyclocross coaching, I thought I would outline in writing what we worked on. It's a good start for anyone who is getting into the sport and a nice reminder for those who have been in it a while and may have developed some bad habits or lost a bit of the flow. I'll write more on the latter in a later installment. Let's review one topic at a time. 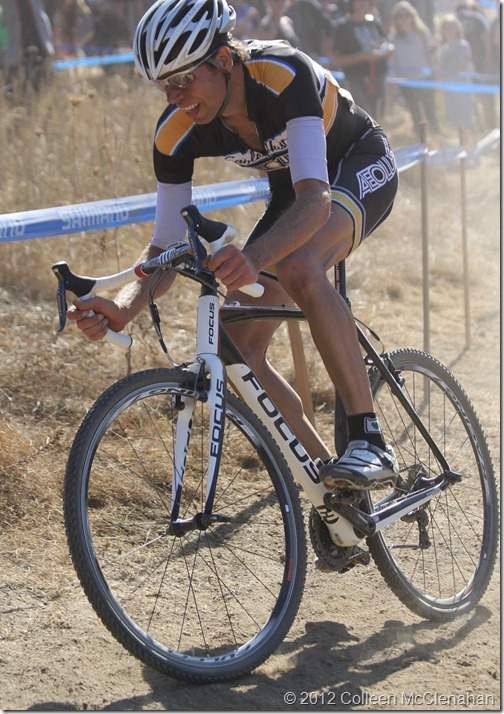 A properly fitted CX bike should feel a bit different than your (properly fitted) road bike. Individual fit is very specific and the following will not apply to everyone. It's best to find a qualified fitter in your area and have that person do a specific fit for your CX bike. Next, check your handlebars. 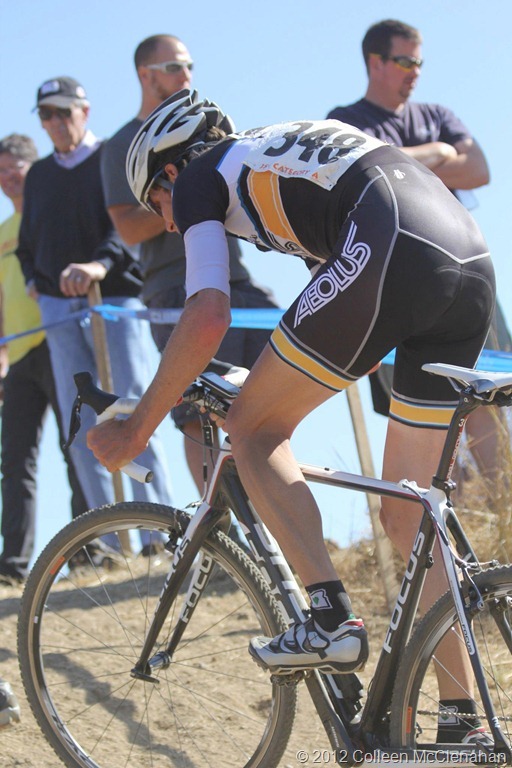 Some riders prefer to have about the same reach as on their road bikes, but with a saddle/handlebar drop that is less than on a road bike. Others prefer to have a shorter reach with the same drop, or a bit less. It depends a bit on your flexibility as well as on the bike itself. 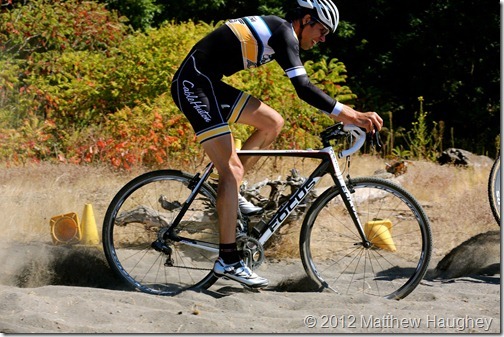 If you're not positioned on the bike the way it is designed for you to be, it won't handle optimally. 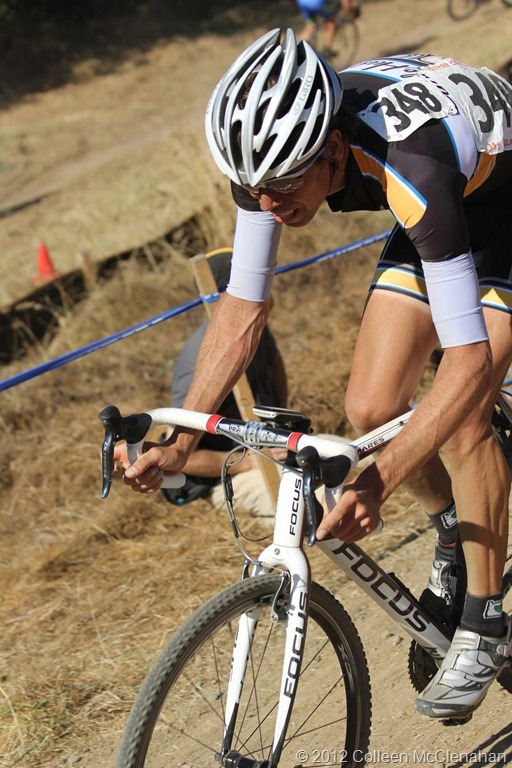 Finally, since a lot of time is spent on the brake levers in 'cross, many riders run their bars and/or brake levers a tilted slightly more upward than on their road bikes. 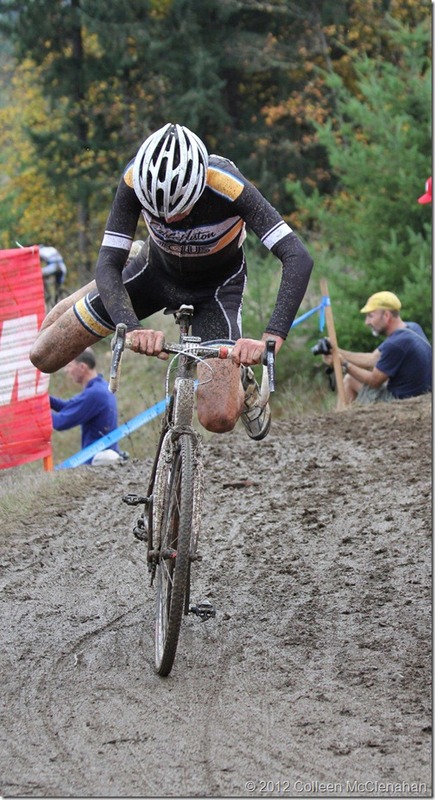 I prefer to do this as well, but I also run compact bars so the drops are not simply along for the ride. Typical road handlebar tilt and brake lever position. CX handlebar tilt. Notice the levers are a bit higher relative to the bar tops. Brake early in slippery conditions so that you don't lock up your wheels on the approach to the corner. Make sure to keep the power on from about 1/4 of the way through the turn. Lean the bike instead of steering it. When the front end slides, keeping the power on will bring the bike back into line. RELAX and have confidence in your bike. It's designed to get you out of trouble, so let it. It is good to practice this in deep, loose gravel (remember, SLOW speed). Once you get used to the front wheel sliding a bit, it won't seem so scary. 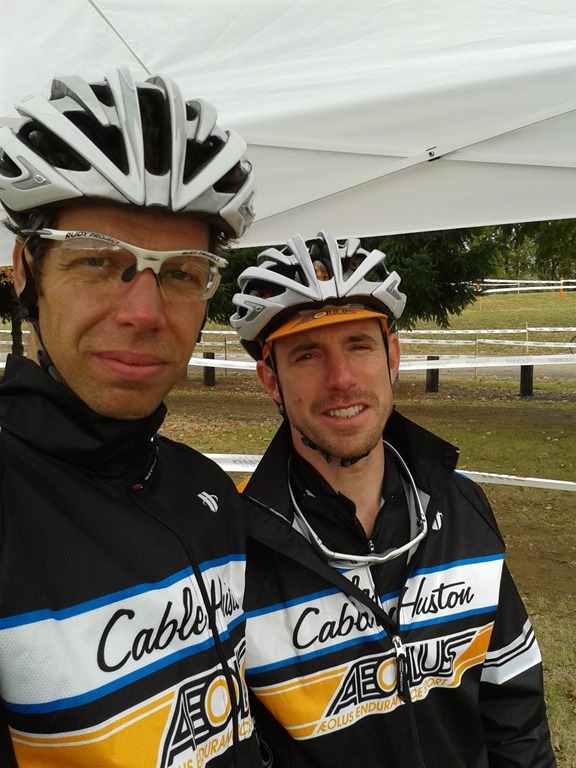 You have worked hard with your cycling coach and have been targeting CX all summer. You have done your endurance homework and built a nice foundation for day-to-day recovery. On this foundation you can build the House of Cross. It's not a church, but with weekly attendance, each Sunday your competition will kneel before the altar of your awesomeness. WU (warm up): 20 mins easy/medium spin. 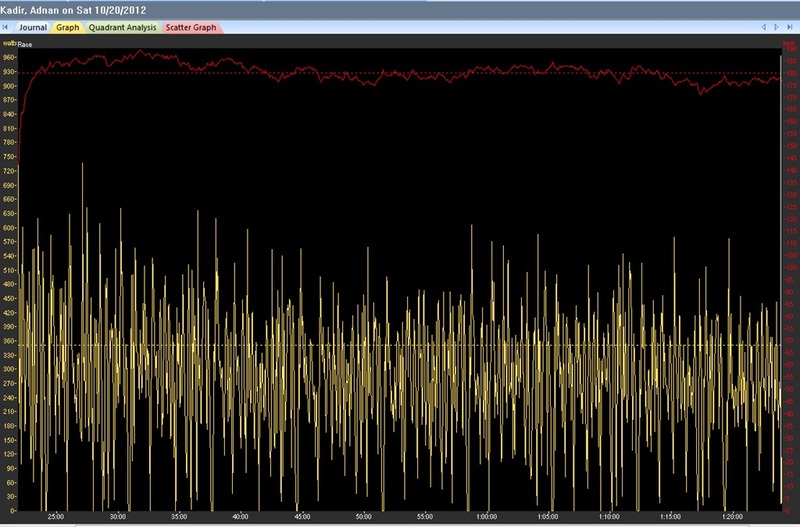 Keep cadence high at 90_+ rpm. MS (main set): Do three sets of 5 x 30 seconds at 100% effort with 30-second spin recoveries. Rolling starts, standing, big gear. Get to top end quickly. Cool down easily and stretch. CD (cool down): 15 to 20 mins easy spin. WU: 15 mins easy spin, L1. MS: 3 sets of 5 x 20 seconds On FULL GAS, 10 seconds OFF with 4 minutes between sets. CD: 15 mins easy spin, L1. WU: 15 mins easy spinning. MS: First 30 mins - SST. Final 30 mins SST. Everything in between at L3 - Tempo. CD: 15 mins easy spin. Easy! Through competition, we discover ourselves. 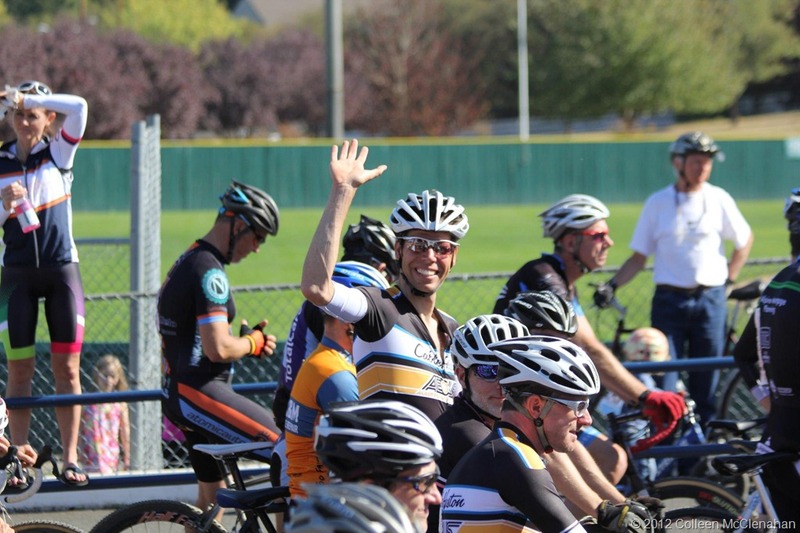 This weekend was a cyclocross double header, with two races on warm, sunny, October days: GPTB Heiser Farms and the traditional Cross Crusade opener at Alpenrose Dairy. Since I'll be away next weekend, I decided that I would do the double. 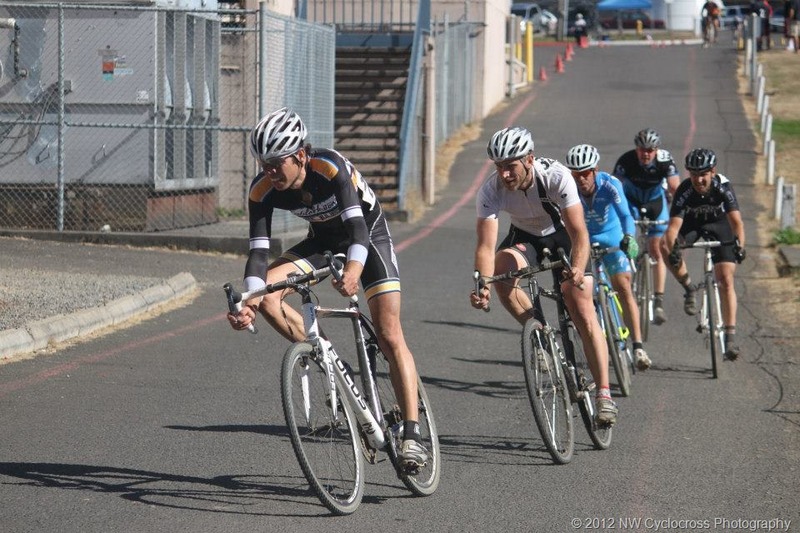 I'm flying fit right now, so I am trying to take advantage of my good form and do as much racing as I can. I'm also having loads of fun and really enjoying myself. 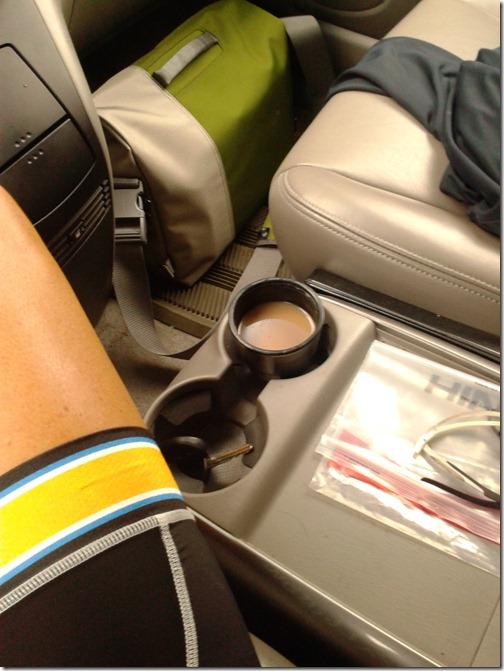 Plus, as a cycling coach, it's good to stay in the game and learn as much about myself as possible. This race was fast and relatively smooth, in terms of one's efforts, with only one dismount over a set of three barriers. With the first Crusade race of the season looming the following day, attendance was a bit lower than normal with about 30 riders taking the start. The competition, however, was still strong with all of the series contenders in attendance. 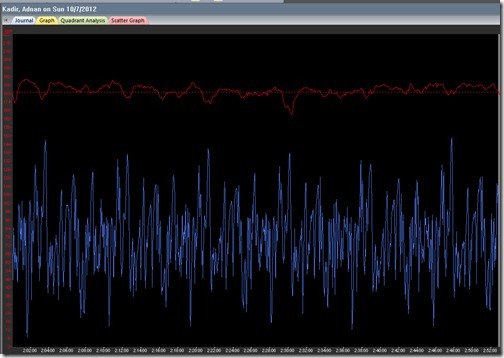 Heiser Farm CX: Red is Heart Rate data, blue is speed data. The dashed red line is at 181bpm. Click the image to magnify. At the start, I accidentally hit the wrong button on my computer, so I'm missing data from the first lap. However, the separation really began on lap 2, and that is where we begin our analysis. My average HR for the race was 181bpm. 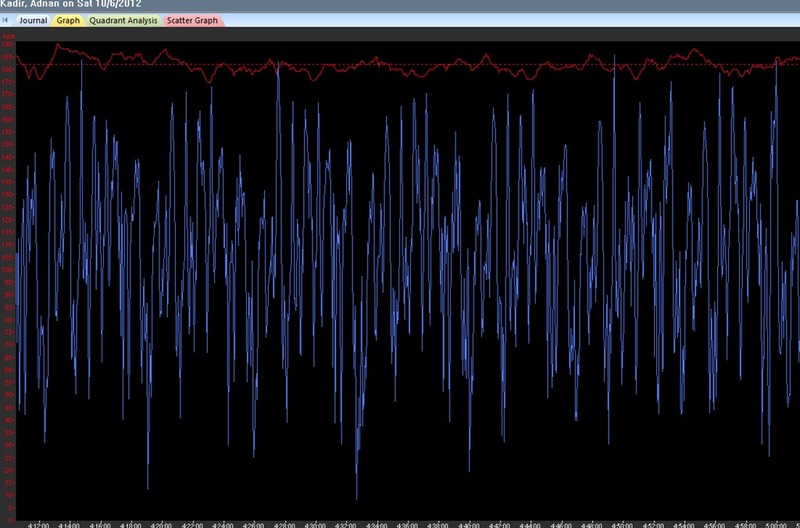 From the graph, you can see that, after the first 3 laps, things settled down a bit. 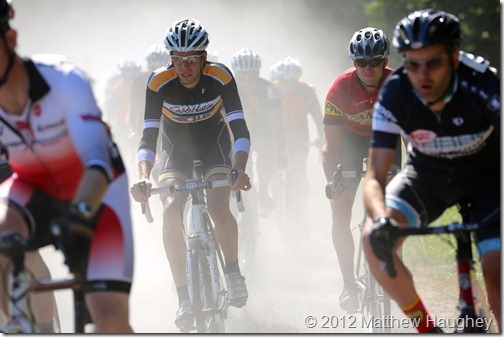 At this point, I was in the main break of 4 riders. With 2 laps to go, my HR goes up again as one rider punctured and the rest of us fought it out until the finish. I came 3rd in that battle, but I gave it all I had, so I feel good about my race. It's been warm and even a bit hot at some races. It's not uncommon to have a "fresh" LTHR and a "fatigued" LTHR that is a few bpm lower. With the combination of the above factors, and keeping this in mind, it is not a stretch to say that my effective LTHR these days is more like 181bpm than 178bpm. The next day proved this again. 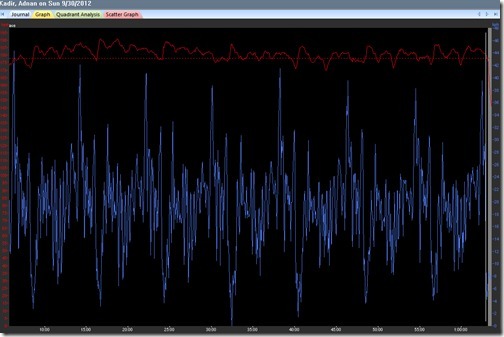 Alpenrose CX: Red is Heart Rate data, blue is speed data. The dashed red line is at 181bpm. Click the image to magnify. This time I hit the correct button at the start, so my data is complete. The start saw the highest HR as all 93 riders in my field careened down a short paved section and into a loose dirt and gravel s-turn. 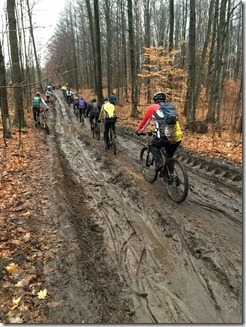 A short descent was followed by a steep ride-up that had everyone fighting for traction. After lap 2, when things began to separate, I got down to the business of making up as much time as possible. 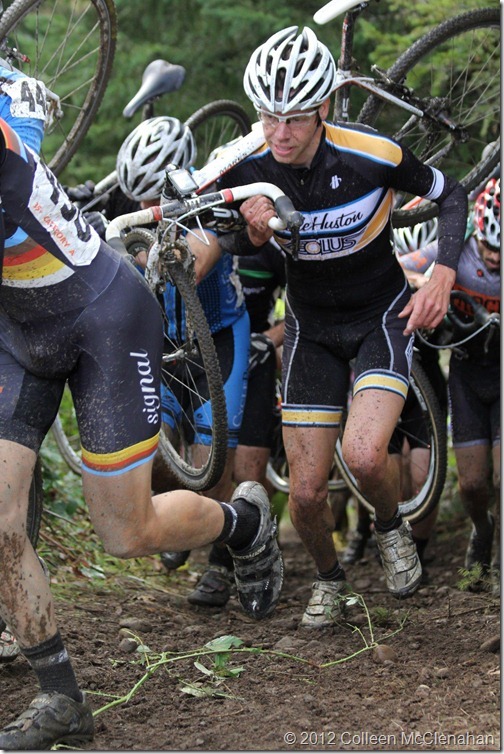 I missed the races at which I could have had the possibility of scoring call-up points, because I was busy racing MTB Marathon Nationals. Thus, I started in the last row. Other than a bit of pacing difficulty mid-race (which is easily seen in the data), and legs which were a bit tired from the day before, I was able to put out a steady effort. This netted me 17th on the day, just inside the points! 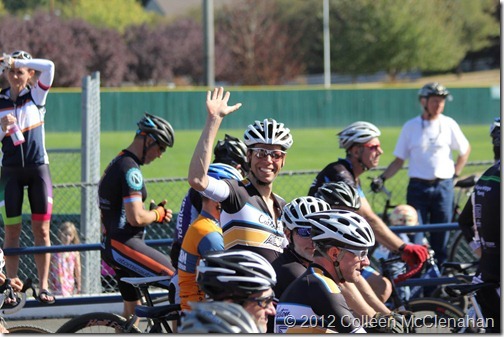 Despite having raced the day before and ridden to this particular race, I was able to maintain an average HR of 182bpm. The heat and a bit of under-hydration played a role in that, I am sure. That, and the crowd support was fantastic. "It is not so difficult. Go flat-out before the corner and then go flat-out again." 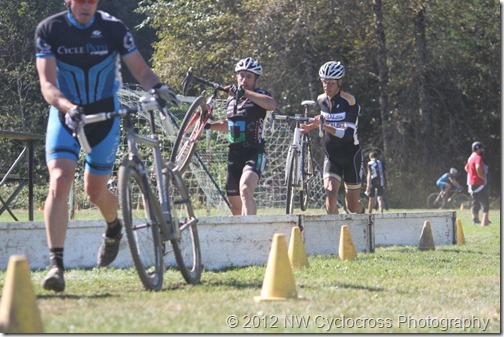 Today I raced the Battle at Barlow, a traditional course east of Portland on the grounds of a high school. The course was dry and dusty, consisting of some open, although bumpy, grass sections, one bit of asphalt, and a few twisty singletrack climbs. The centerpiece of the course was a two-barrier descending dismount, followed by a steep run-down, a wooden bridge, and then a series of tall railroad ties as a run-up. Confused? So was I when I hit it at full speed. I was very fresh, having done very little riding in the previous week in order to try to fully recover from a pulled muscle in my left leg. 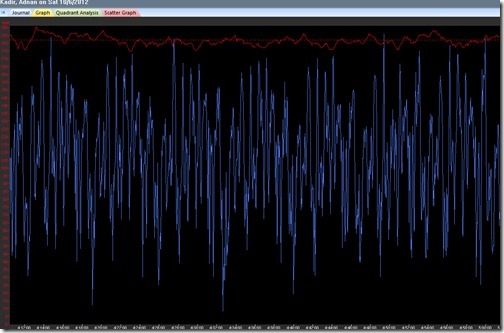 Battle at Barlow CX: Red is Heart Rate data, blue is speed data. The dashed red line is at 178bpm. Click the image to magnify. A dropped chain on the third time up the railroad ties cost me about 7 places. I think I managed to get a couple of those spots back, but I never saw the other guys. This guaranteed that I would be out of the top 10 on the day. 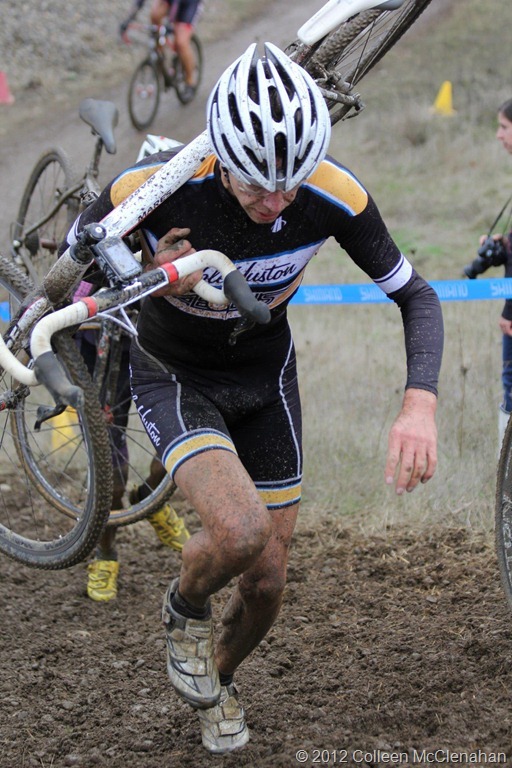 One pays dearly for small mistakes in cyclocross. 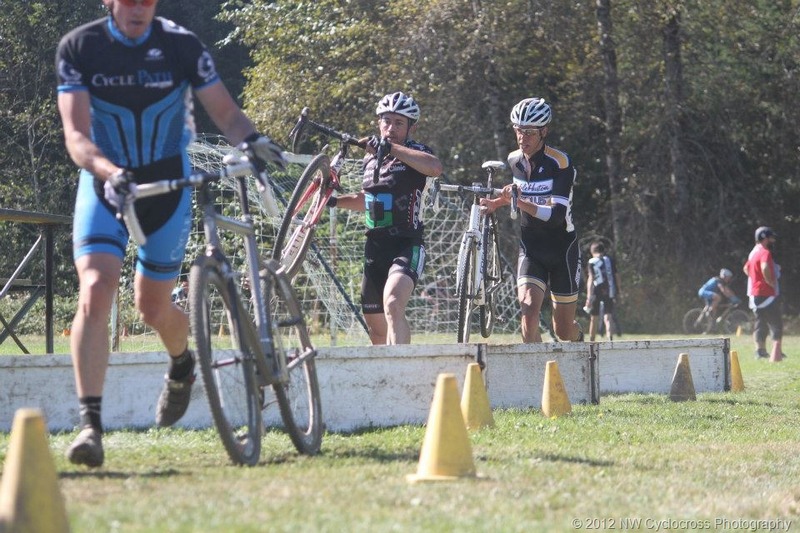 It wasn't the greatest race ever, but I made the best of it and managed to learn a few lessons along the way. I also had the mid-race pleasure of seeing the always-friendly Ira Ryan and that awesome smile. He looked so happy to be racing his bike. 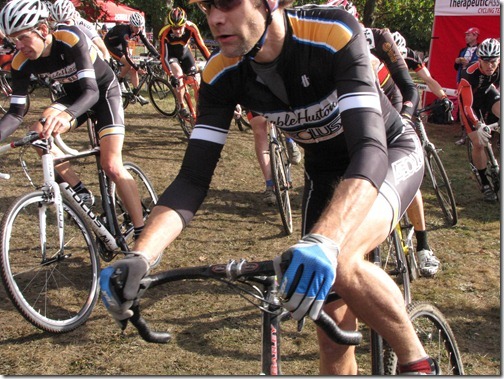 Next up: Heiser Farm CX and the Cross Crusade opener. Today we raced in the sand. 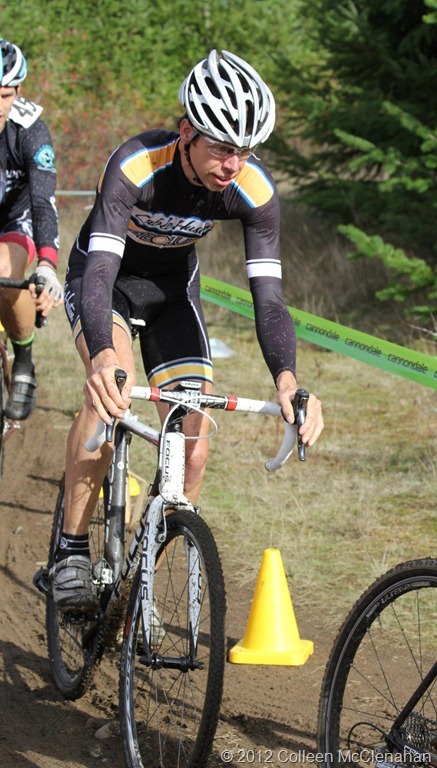 Not far from the scene of Het Meer a couple of weeks ago, Zandercross took place in Vancouver, WA. It's part of a burgeoning series I like to call Couve Cross. Happily, it was a benefit for the excellent non-profit P:ear. 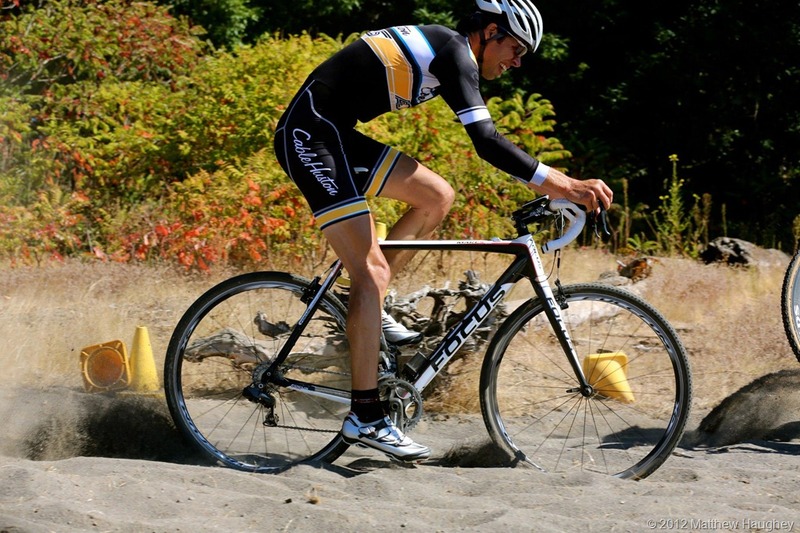 The promoter decided that the main feature of today's race would be sand, and its waterfront venue provided plenty of the loose, deep, and soft stuff. In addition to a few barriers, there were two (for some people three) long running sections in the sand. There were a few steep banks, but all could be ridden if one took the right line. 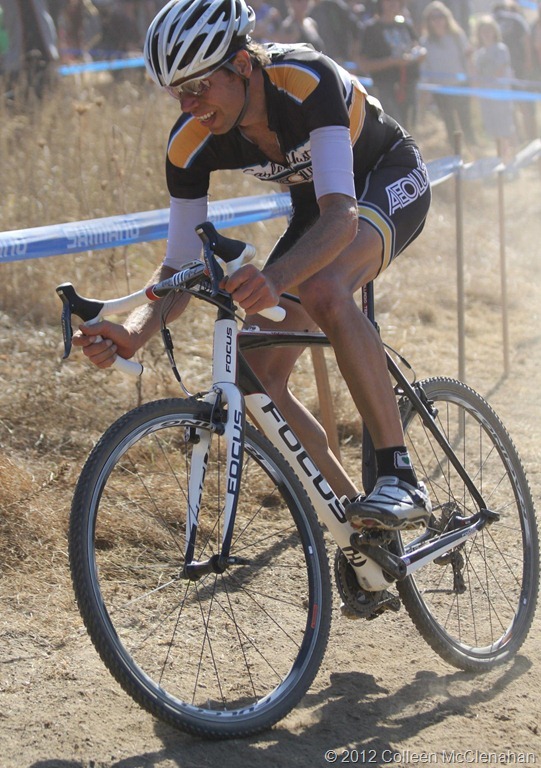 Zandercross. 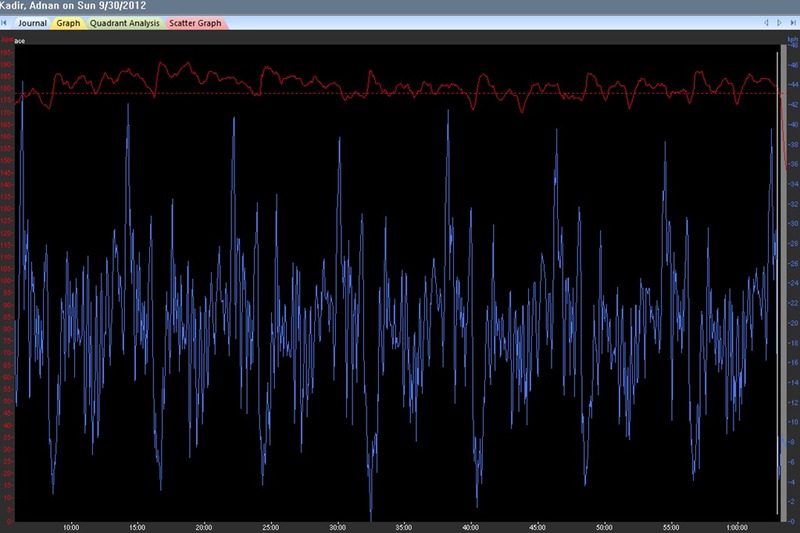 Red is Heart Rate, blue is speed, and orange is elevation data. My LTHR is 178bpm, but today I was able to average 180bpm for the hour-long race. This is possible for a couple of reasons. First, I was relatively fresh. I hadn't done a lot of training in the past week as I was (and am) tired from last weekend. The aerobic system recovers quickly relative to the body, however. So, even though my body was still a little tired, I was able to maintain a slightly higher HR since my aerobic system was relatively fresh. Second, it was warm today. In hotter conditions, one's HR is often slightly elevated. If we break the race into two halves, we can see that I started a bit on the fast side (for me). For the first half of the race, I averaged 183bpm, while for the second half my average HR was 179bpm. I hit my max of 193bpm about 20 minutes in, while passing some people on one of the sand runs. That effort cooked me a bit and afterwards I had to slow down to recover. My effort today netted me 7th place. The start. I got the call-up, but dust makes me chicken.